Real scientists came into school to teach us about DNA! They told us about their careers and taught us that DNA is in all living things. We took our own DNA to support a "police officer" who was investigating who might have broken Miss K's mug. Police use the DNA of suspects to match DNA found at a crime scene. We also made models of a double helix. NSPCC Number Day! Years 5 and 6 worked together in teams on a number of challenges and games. Here we are measuring each other to find average heights, armspan, foot length etc of children in our classes. We also designed our own board games and played games such as 'Who wants to be a mathionnaire?' and Blockbusters! We have been creating a dance to the Holes film soundtrack to show the emotions of the characters. We will perform this routine at Mere Dance Festival. We've been holding debates and writing discussion texts to answer the questions, "Should zoos be banned?" and "Should children who break the law go to prison?" We prepared speeches and aimed to pursuade the opposition to agree with us using formal language and statistics to back up our views. How will great behaviour be rewarded and what consequences are given in Year 6? We showed a video about why we wear poppies. We read some of our emotive poetry. We sang a war time song together. We chose images to support our poems. We were all silent for two minutes. Owls class created a remembrance themed prayer station in the church this week. Please visit the church to write a prayer poppy of peace or to give thanks to those who protect us in wars. Stick your poppy on the display to share with the community. Today Year 6 was so lucky to be able to get up close to a WW2 jeep and motorbike and to try on original helmets. They asked some fantastic questions and were really interested to hear about where the jeep originated from and where it saw action. Thank you so much to Mr and Mrs Davey for bringing them in and for answering all our questions! 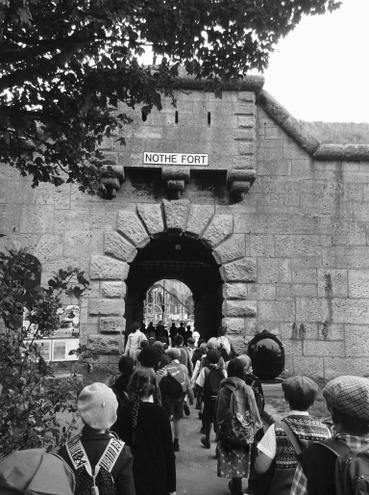 We had a fabulous day at Nothe Fort. The children looked brilliant in their evacuee outfits and their behaviour was superb through out the day. Lots of children have been discussing our topic with their family members and bringing lots of World War 2 objects into school to share. We've seen an army kit bag, an axe used by a fireman to save people during the Blitz, war medals, family photographs and so much more! We've been learning a new, active times tables racing game! We met our Ducking buddies on Friday, gave them our welcome cards and read together. Ducklings and Owls both loved it! Today we used our new Virtuali Tee t shirt and our I pads to look inside our bodies. We looked at our respiratory, skeletal, circulatory, digestive and urinary systems. We took it in turns to look inside using virtual reality. We even were able to go inside our alveoli!